Clinical bodywork incorporates structural bodywork, visceral manipulation, and cranial structural integration to address and correct the root cause of pain, mobility restrictions, postural issues, and more. It releases bound soft tissue that causes muscle constriction, often leading to pain and postural issues. Visceral manipulation gently seeks out restrictions in movement within the organs, or viscera, and manipulates them to restore optimal function. Cranial structural integration utilizes a manual mechanism to align the cranial structures and restore ideal function throughout the body. Red Light Therapy utilizes near and far infrared waves to improve cellular function, promote healing, and provide many aesthetic benefits. It is entirely safe, natural, and has no negative health implications. Tom incorporates red light therapy as a part of clinical massage as well as in independent sessions. 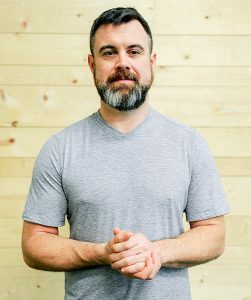 Tom is a clinical bodyworker who focuses on osteopathic techniques such as visceral manipulation, lymphatic drainage therapy, craniosomatic therapy and structural balancing. His techniques tackle a range of complex pain issues and dysfunction. Tom is a father of 2, husband and veteran. *It is recommended that your first session be 90 min.